No sewn in flooring that can't be removed and cleaned. NO MORE OVER SPRAY!- Goodspa/TangoSun offers the "Tan-Hut II", an overspray filtration system that effectively handles your overspray from airbrush or turbine spraying. Goodspa's Tan-Hut II includes "The Power Filter" filtration system that draws any existing overspray through standard disposable filters. This handsome appliance is shipped within one week and is easily assembled. 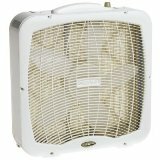 It stands just over six feet tall and is lightweight and durable. 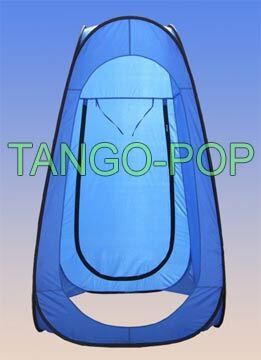 The Goodspa Tan-Hut II makes spray tanning a much safer and enjoyable experience for the operator and the client. The Goodspa Tan-Hut II offers much larger draw area, moving a greater amount of cubic feet per minute than the booths that are fitted with toilet fans. TangoSun is delighted to add this exclusive, rugged, finely crafted tool to our line of quality products. Demensions: Height=7 ft.Width 4 ft. Depth 4ft. Please allow 1 weeks delivery. Click here to see the video of the Tan Hut II being erected in seconds! 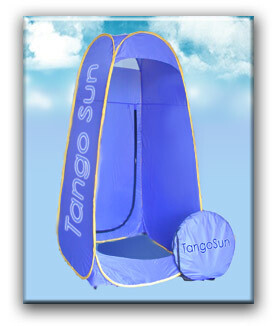 This is our tan, portable popup tanning booth. 7 FEET TALL!!! It has a zippered flap in the back to place a filter unit such as our "Power Filter" The perfect solution to messy over spray from any product. Important: please read this before purchasing. 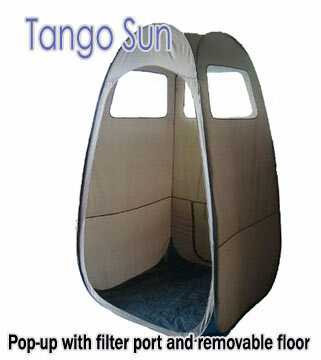 Combine our awesome, Tan colored portable popup with our incredible Power Filter.